News from Milan: lightweight or just small capacity? 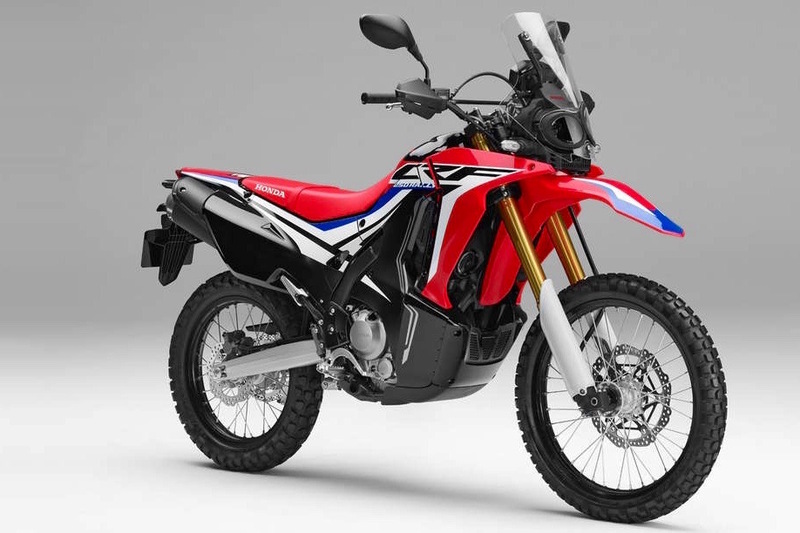 Milan’s 2016 EICMA bike show saw the emergence of several new ‘lightweight adventure bikes’, as some of the biking media have been describing them. 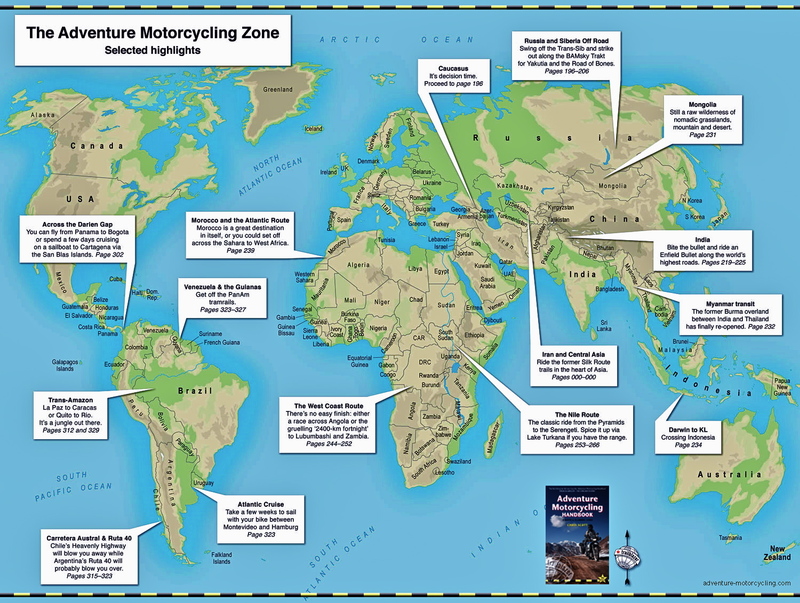 Me, I’d sooner call them ‘small-capacity adventure-styled’ bikes between 250 and 400cc. In some cases they’ve mini versions of established models, a ploy to lure the curious to a brand’s globe-trotting look. 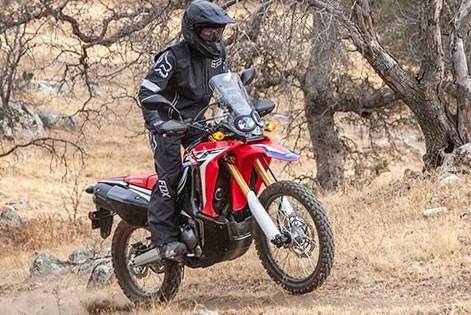 From the specs available, the weight, and therefore suitability for actual adventuring along rough tracks, is nothing to get excited about. The 34-hp BMW 310 single will have more than enough power to achieve this, but is said to weigh some 170kg. 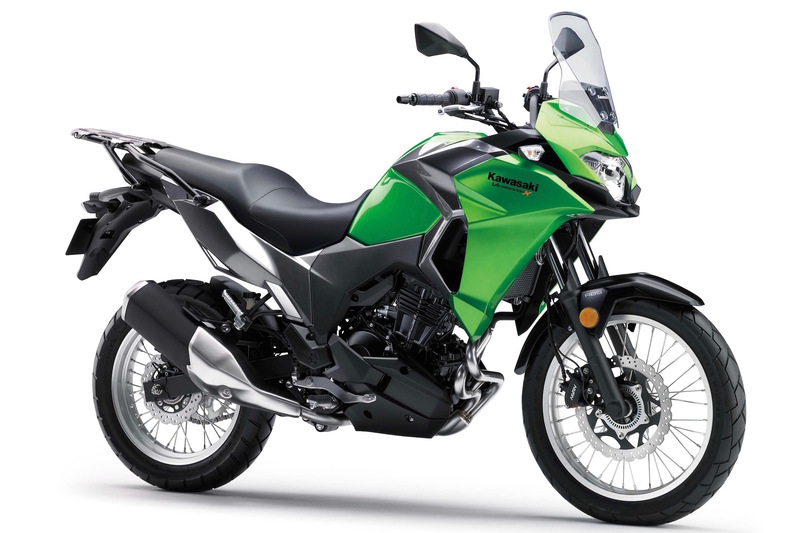 And I doubt the Versys 300 or DL250 (below) will be much lighter. 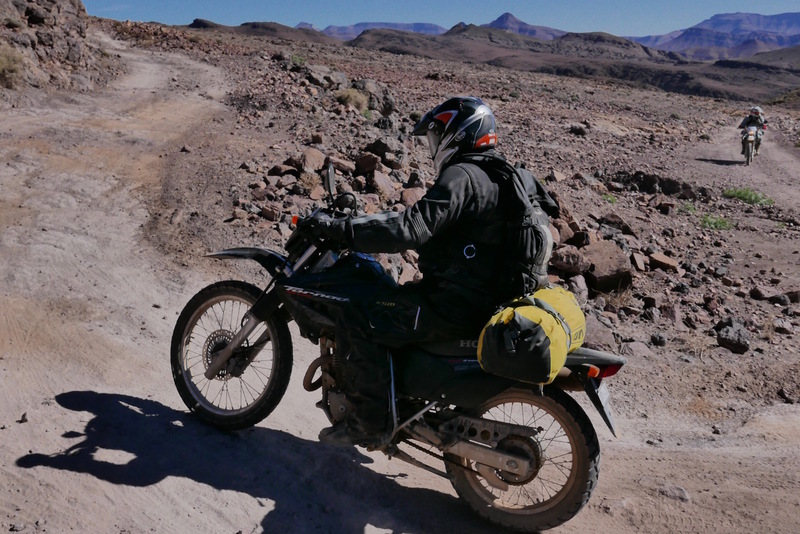 And yet for travellers I suspect light weight is the primary reason for choosing bikes around this 250 category. Seat heights aren’t always so low and their economy isn’t substantially better than say, a CB500X, let alone an NC750, once you balance it against the performance loss which can make you feel a bit vulnerable riding at elevation, uphill in a headwind, as I was last month on my KLX250X. But that usually applies in wealthier countries outside the AMZ (right) where the vehicles aren’t old bangers as they are here in Morocco. For the last two weeks we’ve been riding around on XR250 Tornados (left) which compare very well with current CRF-Ls: less weight, same power and mpg and better suspension. On the road even clapped-out examples running over 88,888km can indicate 120 clicks. And the great thing on the dirt is they’re so unintimidating and forgiving anyone can soon feel comfortable on them. 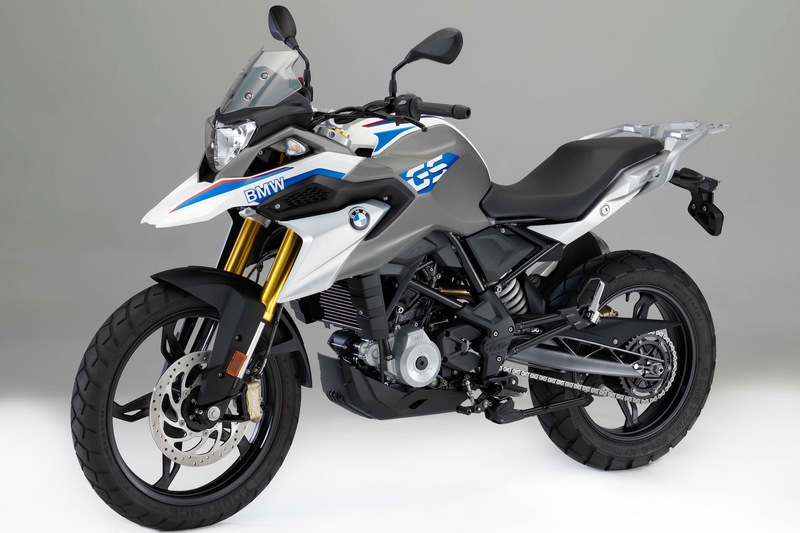 Some of the bikes, like the 300 Versys (left) and Suzuki V-Strom DL250 (right) are parallel twins and unlikely to be any lighter than the BMW 310. You do wonder why make a small twin – some say it helps constrain emissions. More likely it’s to connect the small version with the bigger twins they’re based on. They’re not trail bikes. An often overlooked benefit of small-capacity singles is the lack of vibration compared to a 650 thumper. I was reminded of that as soon as I started a KTM 690 after riding my WR250R recently. Minimal vibration adds a welcome, if small, concession to comfort which some 250s otherwise lack. That’s why 450 is the real segment that interests me, not something in the low 300s cc which I presume fits some licensing category in a promising market. Decent ‘get-out-of-jail’ poke with ideally, not much weight or vibration. Right now all we have is the CCM 450GP (right and reappraised in Rust mag #17). 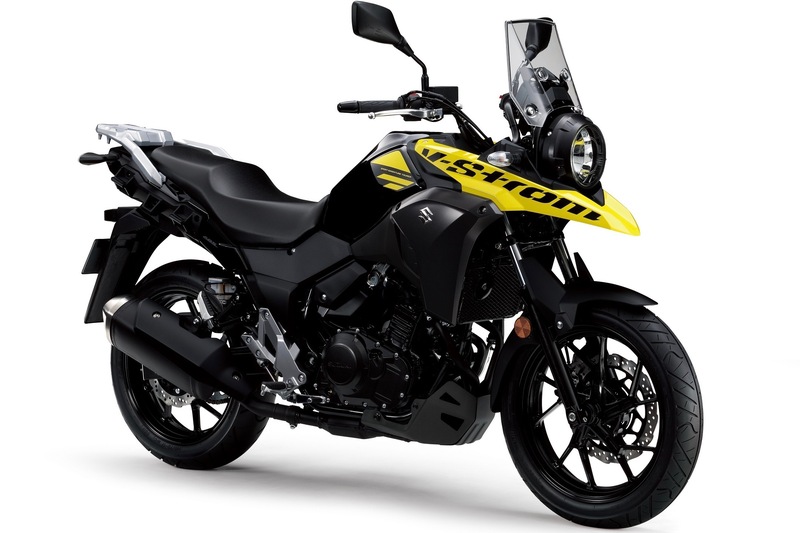 I just had a couple of GP owners on my tour (but renting the XRs), and both confirmed what I’ve suspected without ever having ridden a CCM: for all their amazing light weight and great suspension they run highly strung motors for something pitched as a travel or trail bike, rather than an out-and-out racer. Extensive after-market engine re-mapping may help get round that, but it’s no XR400. 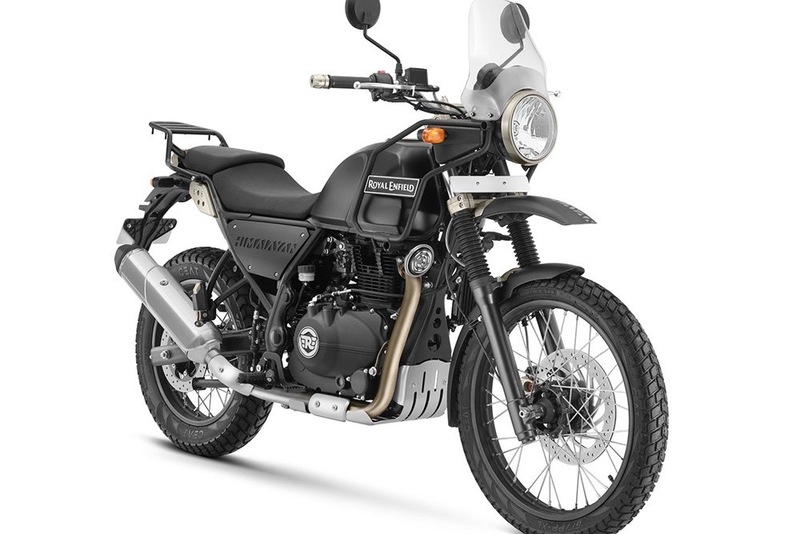 Talking of 400s, they say the 411-cc Enfield Himalayan (right) will be coming to Europe. But by the time they squeeze it through the emissions regs, I bet it won’t have more power than a 2017 CRF250L. (It’s said to produce 24hp and weigh over 180 kilos, wet). That was my impression after riding a similar capacity Chinese 400 last year. Outside of India, Enfield won’t be able to depend on its trusty old plodder cache for ever. Based on looks alone, my favourite is the Rally-styled ‘HRC’ CRF-L (left). The best info and nearly full specs are currently at Honda US. Power is up 10% they say, to 24.4hp, with the weight claimed to stay at 144kg for the standard version (above right – same as the current 250L), and 155kg for the Rally rep. There’s an easy to use comparison table here. The Rally version is not just a quick makeover; Honda have taken it quite seriously. 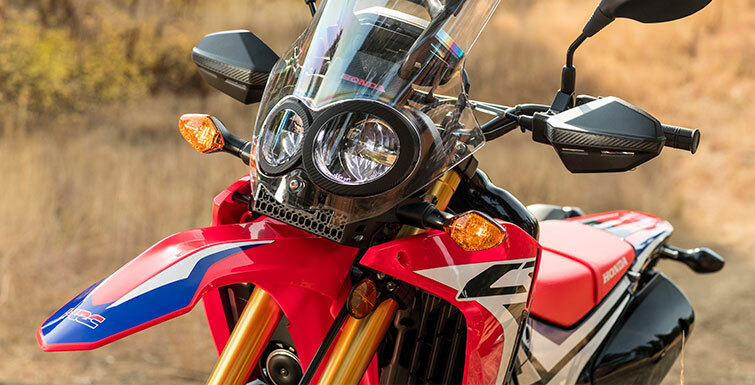 Changes include revised headlight, an inch more rear travel, bigger front disc and tiny differences in castor, rack, wheelbase, suspension damping and seat height. The Rally’s tank holds 10.1 litres against 7.8 litres on the regular bike. This short range was one problem I found on my CRF-L in the US (left). At my average of 30.5kpl that means the Rally ought to be good for 300km which is OK. In the US you’ll pay $5100 or $5900 for the Rally. ABS is another $300 on either and that will add some more weight on the European models where ABS is now mandatory. This rally look: tall screen, large tank, good suspension, lack of bulk, is not just for the kids. 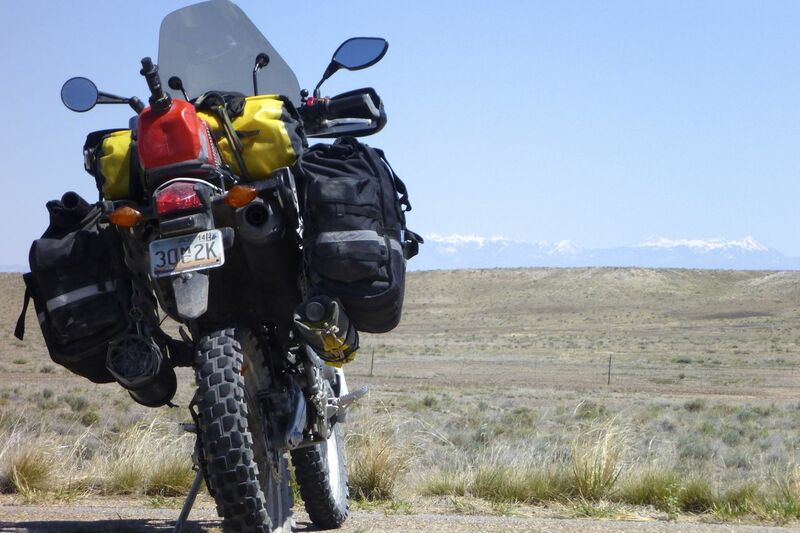 An all-terrain adventure bike traveller benefits from all that too. 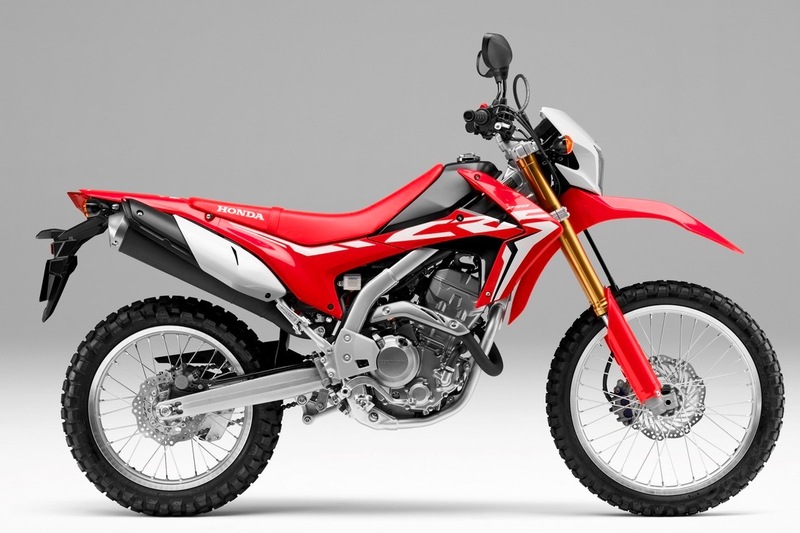 All Honda need to do is win the real Dakar Rally one of these years, and surely they’d crack and finally produce a CRF450L rally rep. What will there be to grumble about then? Oh, it’s just too red! More impressions on these and other travel bikes at next week’s Motorcycle Live show at the NEC. 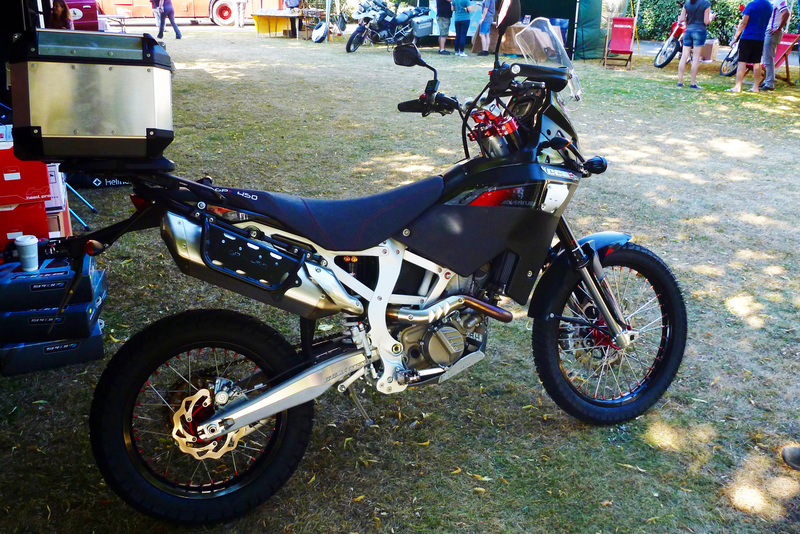 This entry was posted in AMH News, Project: Honda CRF250L and tagged 2017 Honda CRF250L, BMW G310GS, CRF250L, crf250L rally, Enfield Himalayan, Kawasaki versys 300, Suzuki Dl250 V-Strom. Bookmark the permalink.